Early last week, I was out on my porch watching the kiddo ride her scooter up and down the street when I looked over at my screen door to find a rather large praying mantis hanging out there. I figured that the mantis would jump off the door the second we opened it to get back into the house, but it kept clinging to the door even after we opened and closed it several times. 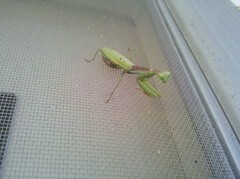 In fact, the praying mantis hung out on the door for about three days. The visit from our praying mantis inspired the kiddo and I to look up some information on them. The praying mantis is thought to be a cousin of the cockroach, branching off their common ancestor, a predatory proto-cockroach with mantis-like forelegs, in the Cretaceous period. They are ambush predators who lie in wait for something that they can devour to pass close by so that they can be caught and held securely with the mantis' grasping, spiked forelegs. One can't look up information about the praying mantis and not run into a discussion about sexual cannibalism. In captivity, female mantises have been observed devouring its mate's head during the mating ritual. Researchers initially believed that the removal of the male’s head was a reproductive strategy that enhanced fertilization while allowing the female to obtain sustenance. Other research has indicated that the behavior appears to be an artifact of intrusive laboratory observation. Kiddo and I learned a lot about the praying mantis and were a little sad to find that it had left after a few days. It was nice to have a visit from an insect that wasn't related to a wasp for once.